Tales from the home of willow and jools: Just for the record. In my previous post here I complained about the appearance in our village of the huge stones at the entrance to the play area. At the time, I didn't know how they would be finished. No information was given beforehand..some people obviously knew but a lot didn't. 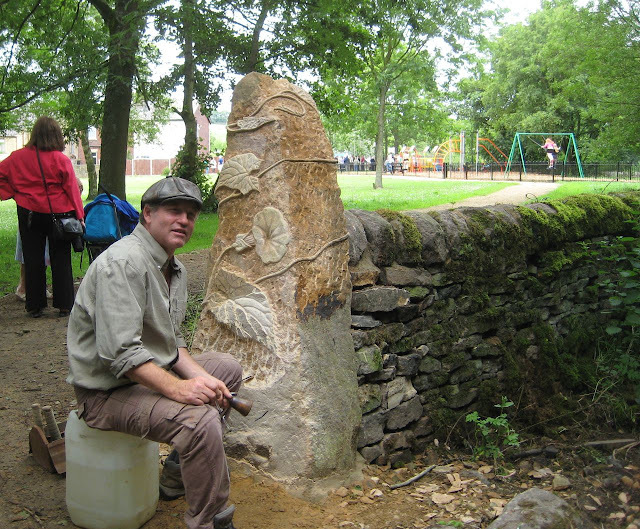 Now I know that the whole play area is beautiful, the stones have been carved by a real artist , and by local schoolchildren, and are an asset to the village. A wooden walkway has been installed around the lodge so that people can walk easily around the waters edge. There has been a wonderful play area installed and trees have been planted and altogether that part is a great success. At the same time, Lancashire County Council were making a mess of the woods. I won't go into many details. THATS the bit I hate. Its getting better but its still a big brutal change to a lovely wild place. It could have been done in a far more sympathetic way. Giving more people access to the woods seems to involve putting up a lot of new fences. So anonymous, I hope I make myself clear. You choose not to add your name or e mail address, so I hope this reply will suffice.